As a full service pool company that specializes in pool construction and remodeling, North Star Pools and Spas will help you build the pool that you’ve been dreaming of, which includes the surrounding landscape. Even if you don’t have a pool, we can provide landscaping services since the skills to perform landscaping naturally follow after the skills to create pools. Many of the hardscape features that are especially common among poolscapes, such as the decking and water fountains, can be built whether they are located at the edge of a pool or not. 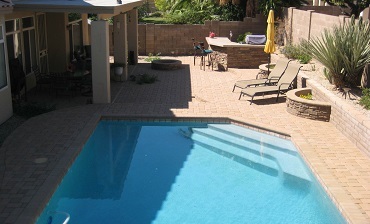 We’ll use the right combination of planers, pavers and softscapes to make your property beautiful. You could also add a basketball court, BBQ, or fire pit for backyard recreation. Similar to the way pool construction begins with design, landscaping also begins with design. We’ll use software to create the design digitally and any revisions can be made during the digital phase to avoid wasting materials. 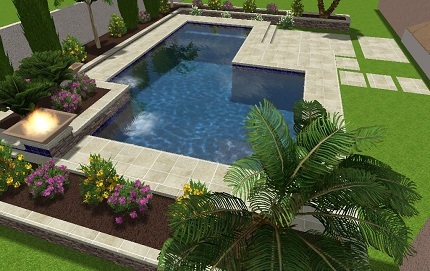 For more digital renderings like the design above, see Landscape Design Gallery and Pool Design Gallery. 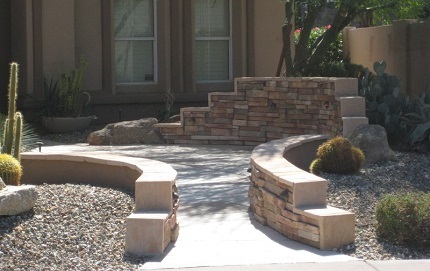 Landscaping is often divided into two categories, hardscapes and softscapes. Hardscapes consist of hard materials, such as concrete, stone, tiles, and other materials that generally do not change with weather or plant growth. Softscapes are made with “soft” materials, such as soil, grass, plants and other materials that can change with the weather or growth. 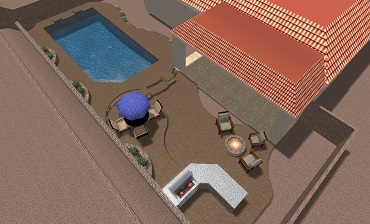 See Landscape Gallery for multiple options of landscape features. 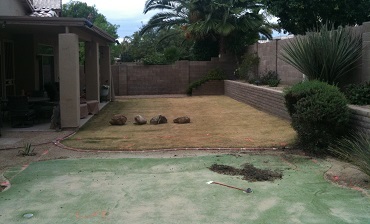 Contact our office in Gilbert to submit a landscaping inquiry.